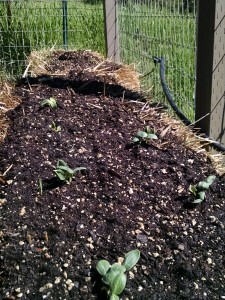 After two weeks of planting the garden is looking pretty good. 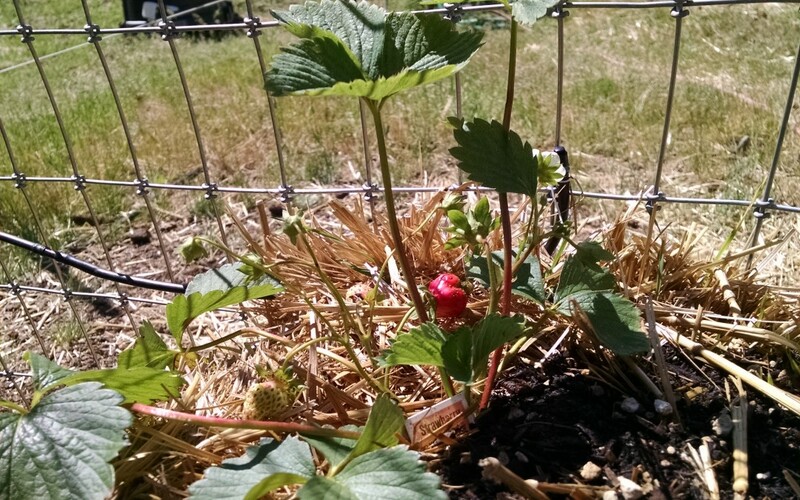 We have our first strawberry coming in. I planted three. Two are looking pretty good. I suppose loosing one is OK for now. It more than likely is a water issue. When JR and I return from Vancouver I will have to redo some of the drip hoses. Good news is we have many of the seeds growing. 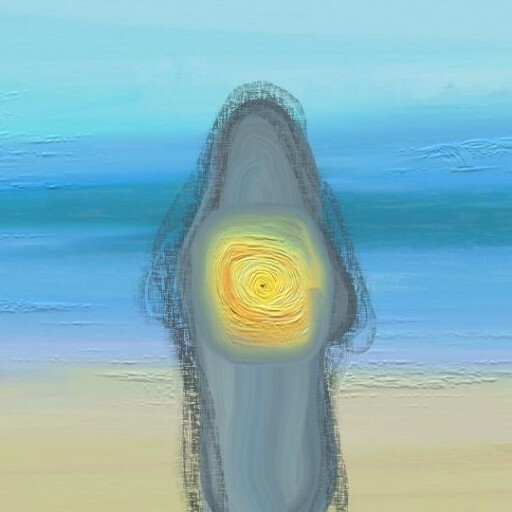 This is the Bean bale. 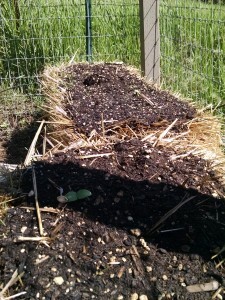 I planted Green and Wax Pole Beans. 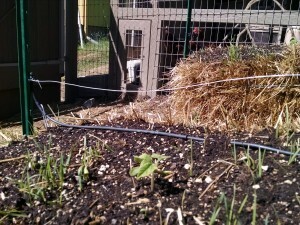 I will have to tie up the plants as they increase in size. I’m excited because I have an amazing Three Bean Salad recipe. I’ll have to post that later as I guess I don’t have a copy of the recipe on the computer. But I must tell you it is super simple and super yummy. As you can see there is a bit of the “Oats” from the straw growing. The only way to not have this is to make sure that the farmer that baled the hay had gleaned all the seed before he baled. In this case there was a lot of seed remaining. It’s OK, that should be the gist of the weeds that I will have to pull. 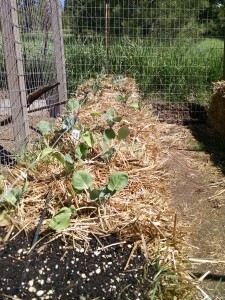 This bale has the Broccoli, Brussel Sprouts and Cabbage. All the plants are looking really good after two weeks with lots of new growth. 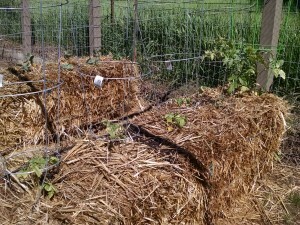 These bales have the Cucumber, Zucchini in the front and in the back bale, Watermelon and Cantaloupe. Here we have the Tomatoes. Three kinds, cherry, heirloom and beef. 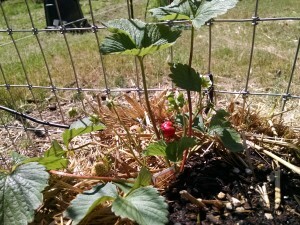 I also have two additional Heirloom growing in the house to be planted in a week or so. Hope you’all like ‘maters because I am going to get a lotta lotta them. 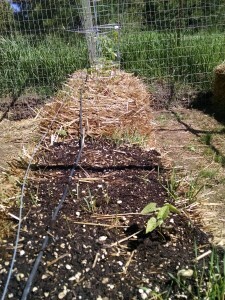 Well that is the quick update on the Straw Bale Garden. I am looking forward to showing off more shots of the growth in the near future.